A couple of years ago I won a 25 year old "spares or repair" Kenwood TH-205E for a few pounds in an eBay auction. I successfully repaired it, but the ni-cad pack had failed short-circuit. I then had a stroke of luck as I found someone selling an 25 year old but unused KNB-4 battery pack for a couple of quid. It held a charge, so the problem was solved. 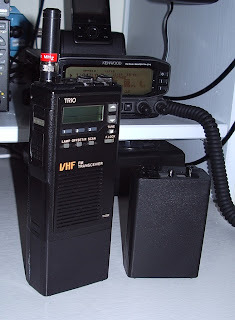 The only disadvantage was that it was the large high capacity battery pack, much taller than the original, making the radio even bulkier than it already is. I nicknamed it "the brick." A few days ago I was looking at the Strikalite web site and noticed that they do battery pack refurbishment. I enquired whether they could repair the 205E's original battery pack. "Send it to us and we'll take a look at it" they said, so I did. A few days later I received a phone call from Strikalite saying "We need to take some money off you." I was a bit concerned as to how much it would be as they had not provided me with an estimate before starting. But I need not have worried. The total cost including postage and VAT was £19.99 which I think is very reasonable. They did quite a neat job, with only a little marking of the case where they had to pry the two halves apart. £20 may seem like more than a 25 year old boat anchor that doesn't support 12.5kHz spacing nor CTCSS for repeater access is worth. But actually the TH-205E has the best, most intermod-resistant receiver of any of my HTs due to the fact that it is designed for the 2m band only, not wide band coverage. If I ever get out on the fells again, the TH-205E would be a strong candidate to take. There's life in the old thing yet! Sounds like the rig is like my Standard C528 which I use from the summits. Bulky when in the pocket, but reliable and tough.